Pan is a 2015 American fantasy film directed by Joe Wright and written by Jason Fuchs. The film serves as a prequel to Peter and Wendy from Scottish author J. M. Barrie, which was first staged in 1904, and focuses on an alternative origin story for Peter Pan and Captain Hook. It stars Hugh Jackman as a fictionalized version of Blackbeard, Garrett Hedlund as Hook, Rooney Mara as Tiger Lily, and Levi Miller as the title character. Pan's world premiere was held in London on September 20, 2015, and it was theatrically released in the United States on October 9, 2015, by Warner Bros. Pictures. 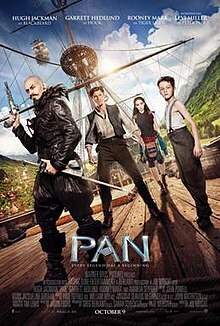 Pan grossed $128.4 million against a production budget of $150 million and was widely considered a box office bomb, resulting in significant loss for the studio. The film received generally negative reviews, with criticism calling the plot formulaic and the action heavily-reliant on CGI. Newborn Peter (Levi Miller) is left on the steps of an orphanage in London, an establishment under the care of the abusive Mother Barnabas (Kathy Burke), and given a mysterious pan flute pendant by his mother Mary (Amanda Seyfried). Several years later, during World War II, upon learning that Mother Barnabas is hoarding food for herself, Peter and his best friend Nibs (Lewis MacDougall) try to steal it to distribute among themselves and the other orphans but they are caught. In the process, they find a letter written to Peter by his mother, declaring her love and assuring him they will meet again "in this world or another". In retaliation for the boys' mischief, Mother Barnabas summons pirates who kidnap Peter, Nibs and several others. Nibs manages to escape but Peter does not. He is taken aboard a flying pirate ship. Following an aerial battle with several Spitfires the ship takes everyone to Neverland, a magical realm beyond space and time, where the children are forced to become a slave laborers and mine for Pixum (crystallized Fairy Dust) on behalf of the terrible pirate Blackbeard (Hugh Jackman) who uses it to prevent himself from aging. Peter becomes acquainted with another miner, who later reveals his name to be James Hook (Garrett Hedlund). After insulting Blackbeard's men, Peter is forced to walk the plank over the deep mine, but survives by flying. Blackbeard then tells Peter about the indian tribe's old prophecy involving a boy who could fly and would lead an uprising to kill him, but Peter refuses to believe in "bedtime stories". Peter joins Hook and his accomplice, Sam "Smee" Smiegel (Adeel Akhtar), and they steal one of the flying ships and escape into the forest. Peter is determined to find his mother and refuses to leave Neverland. There they are found by the indian chief's daughter Tiger Lily (Rooney Mara) and nearly executed but then Chief Great Little Panther (Jack Charles) notices Peter's pendant, left to him by Mary, which is said to belong to their people's greatest hero, the legendary Pan. Using the Memory Tree, "Lily" tells Peter that many years ago when the indians and fairies united to fight together against the pirates. The Fairy Prince and Mary, the love of Blackbeard's life, fell in love. But when Blackbeard discovered them, the Prince took human form to rescue Mary. But as fairies could live in human form for only one day, the Prince sacrificed his life for Mary. Mary was then forced to hide their newborn son Peter in the other world and seek shelter in the Fairy Kingdom when she and the fairies had to retreat. As part of his half-fairy heritage, Peter has the ability to fly, but is unable to do so because of his lack of faith. Fearful of Blackbeard's punishment, Smee betrays the indian's location to him, and in the ensuing battle, Chief Great Little Panther is shot by Blackbeard, who also reveals that he killed Mary. Peter is hurt to learn that Lily lied to him, telling him his mother was still alive, but she explains that he would have walked away from his destiny if he knew the truth. Peter, Hook, and Lily escape in a raft and head for the Fairy Kingdom to enlist their help. Along the way, they are attacked by a giant crocodile and Peter falls into the water, nearly getting eaten before being rescued by the mermaids. After which Lily shows him a vision of Blackbeard accidentally killing Mary as she defended the Fairy Kingdom from him, revealing she was a great warrior, who trained Lily. Despondent over their chances, Hook leaves on an abandoned ship to find home while Peter and Lily arrive at the Fairy Kingdom alone, only to be ambushed by Blackbeard who plans to use the fairies' vast amount of Pixum to live forever. Blackbeard takes Peter's pan flute pendant, which is the key to the fairy kingdom, opens their gates and launches an attack. Peter escapes and meets a fairy named Tinker Bell. Hook suddenly returns on the ship to help them and fights Blackbeard's right-hand man Bishop (Nonso Anozie) while Lily duels Blackbeard. But the ship tips over, sending Hook and Bishop falling to their deaths. Peter conquers his fears and flies to save Hook and then rallies the fairies to fight the pirates. Blackbeard and his men are overpowered by the fairies and Peter saves Lily. Forced into an abyss, Blackbeard and his men fall to their deaths. Smee is the sole survivor having fled during the battle. Peter then sees a vision of Mary, who reaffirms him to be Neverland's savior: Peter Pan. Shortly afterwards, Peter, Lily and Hook, now the captain of the Jolly Roger, return to London to rescue Nibs and the other orphans, who become Peter's crew, the Lost Boys. Hook and Lily fall somewhat in-love. Peter and Hook reaffirm their friendship, certain that nothing will ever go wrong between them. Jason Fuchs at the film's premiere. The script for the film was listed on Hollywood's 2013 Black List. In January 2014, Garrett Hedlund was cast as a younger version of Captain Hook. On January 24, 2014, Jackman was officially cast as the pirate Blackbeard. In February, a casting call was issued for the role of Peter Pan, which went to newcomer Levi Miller in March. In April 2014, Amanda Seyfried was cast. In August 2014, British model Cara Delevingne was chosen to play a mermaid. Rooney Mara was cast as Tiger Lily, causing controversy and accusations of cultural appropriation due to her being of European ancestry, while Tiger Lily is traditionally portrayed as a Native American. Also considered for the role of Tiger Lily were actresses Lupita Nyong'o and Adèle Exarchopoulos. According to critics of the casting there are very few main roles for Native American women in Hollywood, and that the choice not only took one away from a Native American actress, but also perpetuated the invisibility of Native Americans in film. According to TheWrap, director Joe Wright was trying to create a "very international and multi-racial" world, although the majority of main characters (including the four lead actors) are white. A petition was created in response to the casting to urge Warner Bros. studios to stop casting white actors in roles for people of color. Previous portrayals of the Piccaninny tribe in Peter Pan have been criticized as racist. Critics of the casting in Pan suggested that Warner Bros. may have wanted to avoid repeating the alleged racism of previous Peter Pan stories, by altering the ethnicity of the Piccaninnies, rather than using a stereotypical portrayal of the source material. Many also felt that native actresses and actors were never given an opportunity to make it to mainstream films, with native roles being traditionally given to non-natives. On April 28, 2014, the film's principal photography began. Many natural scenes in the film were from Son Doong Cave, Phong Nha-Kẻ Bàng National Park and Ninh Bình Province in Vietnam. The captured scenes were then graphically edited into the film. The film's soundtrack was released in 2015. It was composed by John Powell, and additional music by Anthony Willis, Batu Sener, Paul Mounsey. Dario Marianelli, a frequent collaborator with Wright, had composed a score for the film, but Warner Bros. later replaced him with Powell after test screenings. The cast and crew of Pan at the 2015 San Diego Comic-Con to promote the film. On December 12, 2013, Warner Bros. set for a June 26, 2015 release, with Joe Wright as director. The release was pushed back several times, and the studio eventually decided on October 9, 2015, in part to avoid box office competition from summer blockbusters such as Ant-Man and Mission: Impossible - Rogue Nation. The new release date also gave the producers more time to work on editing and visual effects during post-production. The film was first released in Australia, on September 25, 2015. It was then released in key markets two weeks later, including Germany, Russia, Korea, and Brazil, on October 8. That was followed by Mexico and Spain the next day. The film opened in the United Kingdom on October 16, 2015, and France on October 21, 2015, followed by China on October 22, 2015, Japan on October 31, 2015, and Italy on November 12, 2015. Pan was originally planned for an IMAX release, as evident in early posters, trailers, and press, but was cancelled and only received non-IMAX presentations. Pan was released on DVD and Blu-ray on December 22, 2015, by Warner Home Video, two-and-a-half months after the film's release. Pan was one of the first Ultra HD Blu-ray released on March 1, 2016. Pan was financially unsuccessful. It grossed $35.1 million in North America and $93.2 million in other territories, for a worldwide total of $128.3 million. In comparison, its production budget was reported to be $150 million, and the total spent on marketing was estimated at $100–125 million. In the United States and Canada, the film grossed $5.2 million on its opening day. In its opening weekend, the film grossed $15.3 million, below the studio's $20 million projection, and finished third at the box office. Several factors have been attributed to the financial failure of Pan. Forbes blogger Scott Mendelson attributed this to the absence of notable movie stars. Despite the presence of Jackman, "like any number of would-be big stars who are best known for a certain franchise, his opening weekend strength dips when he's not playing his trademark character." Outside of the X-Men franchise, his biggest openings are Van Helsing ($51 million) and the $27 million debuts of Real Steel and Les Misérables. Variety described the departure of the film in tone and writings that made earlier Peter Pan stories and films a success; from Jackman's role as Blackbeard to the inclusion of contemporary pop songs from Nirvana and the Ramones which is peculiar for a children's film adaptation. "Without the Disney seal of approval, audiences are a bit wary of these fairy tale adaptations," said Jeff Bock, a box office analyst with Exhibitor Relations. He added, "It veered off the Peter Pan path quite extensively and it was just too far left of center for a generation that grew up with Hook and sees that as the definitive account." Warner Bros. declined to discuss Pan's box office results. Pan also struggled internationally, grossing $20.4 million on its opening weekend from 54 markets from over 11,000 screens. 3D comprised 85% of the opening gross. The film was released in Australia on September 24, 2015, to take advantage of the prime September school holidays, where it grossed $1.5 million in its opening weekend. Elsewhere, it opened in the U.K. with $4.1 million, and No. 1 in Mexico ($2.9 million), Brazil ($1.8 million), Indonesia, Malaysia and Thailand and No. 2 in Russia and the CIS with $2 million (behind The Martian), Spain with $1.7 million (behind Regression), Hong Kong, Singapore and the Philippines. The Hollywood Reporter estimated that the film cost $275 million to produce and market worldwide—while The New York Times reported at least $250 million—and noted that the financial losses by Warner Bros. could finish anywhere between $130 to $150 million. The site suggested that if the film overperformed in China—the world's second largest movie market—the losses could have been lower. Opening in China on October 22, 2015, it failed to meet expectations. Based on its production cost and factoring in the percentage of ticket sales kept by theater owners, analysts estimated that Pan needed to take in at least $400–500 million worldwide to break even. The financial loss incurred by Pan puts it alongside Tomorrowland and Jupiter Ascending as one of the biggest box office failures of 2015. On review aggregation website Rotten Tomatoes, the film has an approval rating of 26%, based on 193 reviews, and an average rating of 4.56/10. The website's critical consensus reads, "Pan finds a few bursts of magic in its prequel treatment of classic characters, though not enough to offset the rushed plot and shrill, CGI-fueled action." On Metacritic, the film a score of 36 out of 100 based on reviews from 35 critics, indicating "generally unfavorable reviews". A.O. Scott of The New York Times called the action scenes "murky and chaotic" and stated, "The dominant emotion in Pan is the desperation of the filmmakers, who frantically try to pander to a young audience they don’t seem to respect, understand or trust." The main characters lacked chemistry and depth according to Todd McCarthy of The Hollywood Reporter, who added that with the exception of Levi Miller's Pan, "the characters don't reasonably comport with one's pre-existing images of them". He also called a good portion of the film "a seriously extended chase that possesses hefty CGI-propelled dynamics but absolutely no suspense and a very limited sense of fun". Andrew Barker of Variety praised the film's technical achievements and action sequences but found it depressing overall: "Pan swaps puckish mischief and innocence for doses of Steampunk design, anachronistic music, a stock “chosen one” narrative and themes of child labor, warfare and unsustainable mineral mining exchanges". In a more positive review, Bill Zwecker of Chicago Sun-Times gave the film 3 out of 4 stars, calling Levi Miller "a truly wonderful cinematic discovery" and adding that the film is "chock-full with thrilling action sequences, vivid costumes and well-executed special effects". Audiences polled by CinemaScore gave the film an average grade of "B+" on an A+ to F scale, while PostTrak reported filmgoers gave it a 78% overall positive score. ^ McCarthy, Todd (September 19, 2015). "'Pan': Film Review". The Hollywood Reporter. Retrieved June 1, 2017. 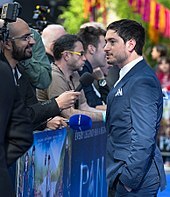 ^ "World Premiere of 'Pan' in London - Photos". UPI. ^ "PAN [2D] (PG)". British Board of Film Classification. September 17, 2015. Retrieved September 17, 2015. ^ a b "Pan (2015)". British Film Institute. Retrieved June 1, 2017. ^ Pamela McClintock (April 21, 2015). "Summer Box Office: What's Behind Warner Bros.' Risky Move to Release Nine Movies". The Hollywood Reporter. (Prometheus Global Media). Retrieved April 21, 2015. ^ a b "Pan (2015)". Box Office Mojo. Retrieved February 29, 2016. ^ "Pan (2015)". American Film Institute. Retrieved August 7, 2018. ^ Pan – World Premiere - Official Warner Bros. UK. YouTube. September 21, 2015. ^ a b "Levi Miller Tapped to Play Peter Pan in Warner Bros.' 'Pan' (EXCLUSIVE)". Variety. March 18, 2014. Retrieved July 28, 2014. ^ a b Perlman, Jake (January 24, 2014). "Hugh Jackman to star in Joe Wright's Peter Pan movie". Insidemovies.ew.com. Retrieved July 28, 2014. ^ a b c d "Amanda Seyfried Joins Warner Bros.' Peter Pan Adaptation". The Hollywood Reporter. April 24, 2014. Retrieved July 28, 2014. ^ "Amanda Seyfried Boards Joe Wright's Pan". ComingSoon.net. April 24, 2014. Retrieved July 28, 2014. ^ Linds Foley. "Cara Delevingne hits the red carpet for the world premiere of PAN". Sugarscape. ^ "Amanda Seyfried Joins Warner Bros.' Peter Pan Adaptation". The Hollywood Reporter. April 24, 2014. Retrieved April 28, 2014. ^ Miller, Levi. "Pan Trailer". Contactmusic.com. Retrieved 6 September 2015. ^ "The Black List Announces 2013 Screenplays (Complete List)". Variety. December 16, 2013. Retrieved July 28, 2014. ^ "Garrett Hedlund to play Captain Hook in Peter Pan movie? - Movies News - Digital Spy". Digitalspy.ca. January 23, 2014. Retrieved July 28, 2014. ^ Mark Brown, arts correspondent. "Looking for lost boys: Hollywood bosses launch search for a Peter Pan | Film". The Guardian. Retrieved July 28, 2014. ^ "omg! get a first look at cara delevingne in pan". Nylon. Retrieved August 6, 2014. ^ "Rooney Mara to Play Tiger Lily in Warner Bros.' 'Pan'". Variety. March 12, 2014. Retrieved July 28, 2014. ^ Perlman, Jake (March 13, 2014). "Rooney Mara as 'Peter Pan's' Tiger Lily: A look at the controversy | PopWatch | EW.com". Popwatch.ew.com. Retrieved July 28, 2014. ^ Pickett, Leah. "Why Aren't we more upset about racism against native americans". www.dailydot.com. Retrieved December 14, 2014. ^ Garcia, Alma (2012). Contested Images: Women of Colour in Popular Culture. Lanham, Md. : AltaMira Press. p. 45. ISBN 0759119635. Retrieved December 14, 2014. ^ "Rooney Mara in Negotiations to Play Tiger Lily in Warner Bros.' 'Pan'". TheWrap. March 12, 2014. Retrieved September 6, 2015. ^ Baker-Whitelaw, Gavia. "This new photo of Tiger Lily is terrible PR for 'Pan'". www.dailydot.com. Retrieved December 14, 2014. ^ McDonald, Soraya Nadia. "Thousands Petition Warner Bros. over Rooney Mara's casting as Tiger Lily". www.washingtonpost.com. Retrieved December 14, 2014. ^ a b ICTMN Staff. "Rooney Mara's Tiger Lily Could Not Be Less Native. That's A Problem". www.indiancountrytodaymedianetwork.com. Retrieved December 14, 2014. ^ "Hollywood Wants To Cast Rooney Mara As A Native American, We Native Americans Want Hollywood To Give Us A Chance". March 19, 2014. ^ "On The Set For 5/5/14: Hugh Jackman Starrer 'Pan' Starts For Warner Bros., New Line Cinema's 'Crawlspace' Wraps". SSN Insider. 2014-05-05. Retrieved 2015-10-11. ^ Savas, Kaya (October 11, 2015). "Pan by John Powell (Review)". Film.Music.Media. Retrieved January 7, 2017. ^ "Warner Bros. Sets Joe Wright's Pan release date for June 26, 2015". ComingSoon.net. December 12, 2013. Retrieved July 28, 2014. ^ "Warner Bros. Pictures Pushes Batman vs. Superman Back to 2016". ComingSoon.net. January 17, 2014. Retrieved July 28, 2014. ^ "Warner Bros. Pushes Back Joe Wright's Pan by a Week, Shifts Out of Ant-Man's Shadow". FinalReel.co.uk. Retrieved December 12, 2014. ^ "Hugh Jackman's 'Pan' Moves Back from Summer to Fall". Variety. April 20, 2015. Retrieved April 20, 2015. ^ "Hugh Jackman's 'Pan' Moves From Summer to Fall". The Hollywood Reporter. April 20, 2015. Retrieved April 21, 2015. ^ a b Anita Busch (September 27, 2015). "'Hotel Transylvania 2,' 'The Intern' Bow Amidst Holdovers 'Everest' And 'Scorch Trials' – Intl Box Office". Deadline Hollywood. (Penske Media Corporation). Retrieved September 28, 2015. ^ "New Pan Featurette Goes in Depth on the Film's Colorful 3D Worlds - ComingSoon.net". September 15, 2015. Retrieved June 19, 2016. ^ Brent Lang (February 10, 2016). "Time Warner Reports Mixed Quarterly Results Due to Movie Flops". Variety. Retrieved February 10, 2016. ^ a b c d Pamela McClintock (October 12, 2015). "Warner Bros.' 'Pan' Could Lead to $150 Million Loss". The Hollywood Reporter. (Prometheus Global Media). Retrieved October 13, 2015. ^ a b c d Brooks Barnes (October 11, 2015). "'Pan' Bombs at the Box Office". The New York Times. Retrieved October 14, 2015. ^ a b Anthony D'Alessandro (October 12, 2015). "'Martian' Still Has Fuel In Its Second Frame; 'Pan' Walks Plank; 'Steve Jobs' Popular In NY & LA – Monday Postmortem". Deadline Hollywood. Retrieved October 14, 2015. ^ Scott Mendelson (October 12, 2015). "Box Office: 4 Reasons 'Pan' Bombed". Forbes. Retrieved October 14, 2015. ^ a b c Brent Lang (October 12, 2015). "Does 'Pan's' Box Office Bomb Spell the End for Origin Stories?". Variety. (Penske Media Corporation). Retrieved October 14, 2015. ^ a b Nancy Tartaglione (October 12, 2015). "'The Martian' Crosses $118.5M Offshore; 'Pan' Serves Up Est. $20.4M – Intl B.O. Final". Deadline Hollywood. (Penske Media Corporation). Retrieved October 13, 2015. ^ Nancy Tartaglione (October 18, 2015). "'Ant-Man' Supersizes With $43.2M China Bow; 'Crimson Peak' Reaps $13.4M – International Box Office". Deadline Hollywood. Retrieved October 19, 2015. ^ a b Patrick Brzeski (October 28, 2015). "Why China Is Panning 'Pan'". The Hollywood Reporter. (Prometheus Global Media). Retrieved October 29, 2015. ^ a b "Pan (2015)". Rotten Tomatoes. Fandango Media. Retrieved April 4, 2019. ^ "Pan Reviews". Metacritic. CBS Interactive. Retrieved October 11, 2015. ^ Scott, A.O. (October 8, 2015). "Review: 'Pan' Proposes Peter and Captain Hook's Origin Stories". The New York Times. Retrieved August 7, 2018. ^ a b McCarthy, Todd (September 19, 2015). "'Pan': Film Review". The Hollywood Reporter. Retrieved August 7, 2018. ^ Andrew Barker (September 19, 2015). "Film Review: 'Pan'". Variety. Retrieved September 20, 2015. ^ Zwecker, Bill (October 9, 2015). "From Boy to 'Pan': Jaunty Jackman, talented newcomer star in prequel pulsating with action". Chicago Sun-Times. Retrieved August 7, 2018. Wikimedia Commons has media related to Pan (2015 film). Captain James Hook is a fictional character, the main antagonist of J. M. Barrie's play Peter Pan; or, the Boy Who Wouldn't Grow Up and its various adaptations, in which he is Peter Pan's archenemy. The character is a pirate captain of the brig Jolly Roger. His two principal fears are the sight of his own blood and the crocodile who pursues him after eating the hand cut off by Pan. An iron hook replaced his severed hand, which gave the pirate his name. Peter Pan is a 2003 fantasy adventure film released by Universal Pictures, Columbia Pictures, and Revolution Studios. It was the first authorised and faithful film or television adaptation of J.M. Barrie's play Peter Pan, or The Boy Who Wouldn't Grow Up in half a century, after Disney's version in 1953. P. J. Hogan directed a screenplay co-written with Michael Goldenberg which is based on the play and novel by J. M. Barrie. Jason Isaacs plays the dual roles of Captain Hook and George Darling, Olivia Williams plays Mrs. Darling, while Jeremy Sumpter plays Peter Pan, Rachel Hurd-Wood plays Wendy Darling, and Ludivine Sagnier plays Tinker Bell. Lynn Redgrave plays a supporting role as Aunt Millicent, a new character created for the film. Joseph Wright is an English film director. His motion pictures include the romance film Pride & Prejudice (2005), the romantic war drama Atonement (2007), the action thriller Hanna (2011), his adaptation of Anna Karenina (2012), Peter Pan origin story Pan (2015), and Darkest Hour (2017), a political drama set during World War II. Patricia Rooney Mara is an American actress. She began her career playing supporting roles in several independent films, including the coming-of-age drama film Tanner Hall (2009), before starring as Nancy Holbrook in the 2010 remake of A Nightmare on Elm Street and as Erica Albright in the biographical drama film The Social Network (2010). Her is a 2013 American romantic science-fiction drama film written, directed, and produced by Spike Jonze. It marks Jonze's solo screenwriting debut. The film follows Theodore Twombly, a man who develops a relationship with Samantha, an artificially intelligent virtual assistant personified through a female voice. The film also stars Amy Adams, Rooney Mara, and Olivia Wilde. Annabelle is a 2014 American supernatural horror film directed by John R. Leonetti, written by Gary Dauberman and produced by Peter Safran and James Wan. It is a prequel to 2013's The Conjuring and the second installment in the Conjuring Universe franchise. 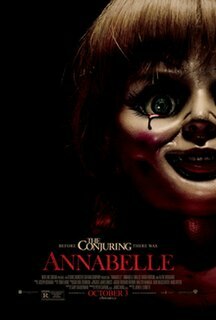 The film was inspired by a story of a doll named Annabelle told by Ed and Lorraine Warren. The film stars Annabelle Wallis, Ward Horton, and Alfre Woodard. Mowgli: Legend of the Jungle is a 2018 adventure drama film directed by Andy Serkis with a screenplay by Callie Kloves, based on stories collected in All the Mowgli Stories by Rudyard Kipling. The film stars Rohan Chand, Matthew Rhys, and Freida Pinto, along with voice and motion capture performances from Christian Bale, Cate Blanchett, Benedict Cumberbatch, Naomie Harris, and Serkis. Kong: Skull Island is a 2017 American monster film directed by Jordan Vogt-Roberts. 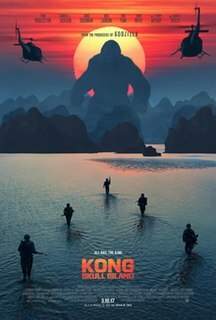 The film is a reboot of the King Kong franchise, and serves as the second film in Legendary's MonsterVerse. The film stars Tom Hiddleston, Samuel L. Jackson, John Goodman, Brie Larson, Jing Tian, Toby Kebbell, John Ortiz, Corey Hawkins, Jason Mitchell, Shea Whigham, Thomas Mann, Terry Notary, and John C. Reilly. The Warner Animation Group (WAG) is the feature animation division of Warner Bros. Entertainment. Established on January 7, 2013, the studio is the successor to the dissolved 2D traditional hand-drawn animation studio Warner Bros. Feature Animation, which shut down in 2003. Its first film The Lego Movie was released on February 7, 2014 and its latest release was The Lego Movie 2: The Second Part on February 8, 2019; with their next release being Scoob, a Scooby-Doo animated film on May 15, 2020. The DC Extended Universe (DCEU) is an unofficial term used to refer to an American media franchise and shared universe that is centered on a series of superhero films, distributed by Warner Bros. Pictures and based on characters that appear in American comic books by DC Comics. The shared universe, much like the original DC Universe in comic books and the television programs, was established by crossing over common plot elements, settings, cast, and characters. The films have been in production since 2011 and in that time Warner Bros. has distributed seven films. Sully is a 2016 American biographical drama film directed by Clint Eastwood and written by Todd Komarnicki, based on the autobiography Highest Duty by Chesley Sullenberger and Jeffrey Zaslow. The film stars Tom Hanks as Sullenberger, with Aaron Eckhart, Laura Linney, Anna Gunn, Autumn Reeser, Holt McCallany, Jamey Sheridan, and Jerry Ferrara in supporting roles. 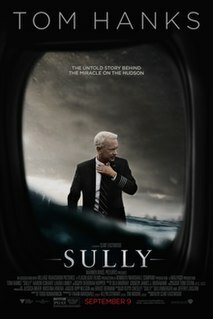 The film follows Sullenberger's January 2009 emergency landing of US Airways Flight 1549 on the Hudson River, in which all 155 passengers and crew survived with only minor injuries, and the subsequent publicity and investigation. The MonsterVerse is an American media franchise and shared fictional universe that is centered on a series of monster films featuring Godzilla and King Kong, produced by Legendary Entertainment and co-produced and distributed by Warner Bros. The first installment was Godzilla (2014), a reboot of the Godzilla franchise, which was followed by Kong: Skull Island (2017), a reboot of the King Kong franchise. The next film to be released will be Godzilla: King of the Monsters (2019), followed by Godzilla vs. Kong (2020). With two films released to date, the series has grossed over $1 billion worldwide.